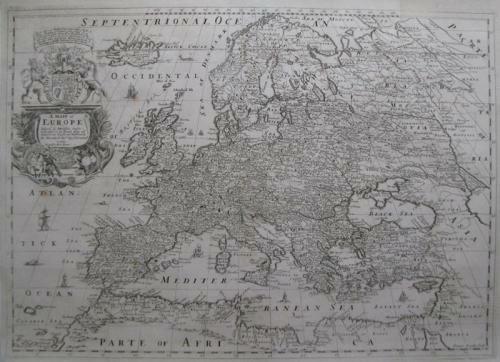 Title: A Generall Map of Europe..
A striking dark impression of this scarce map of Europe. The map features an elaborate heraldic cartouche and many sailing ships and sea monsters. Blome's maps, because of their rarity and importance in the history of English Cartography, are essential items for regional collectors. Blome first began engraving maps for his Geographical Description Of The Four Parts Of The World in 1667. The completed volume was in small folio, and contained 24 maps (plus one duplicated), engraved by Francis Lamb, Thomas Burnford and Wenceslas Hollar. Blome's principal handicap in the production of the atlas was the lack of a domestic mapmaking environment comparable with that in Europe. Also, to finance his work, he undertook subscribers, in exchange for a promise to add their coat of arms to certain maps. In later editions, if the renewal fee was not paid, Blome added a different subscribers coat of arms, leading to multiple images on various editions of the same map. Condition is very good with a narrow margins as issued and a couple of repaired worm holes at the centerfold.